finally, a trend that almost has us willing to embrace winter. An all white kitchen is so 2015. This year’s designs will be just as glamorous with lots more color in soft shades that act like neutrals. We’re loving these soft blue cabinets in Nina Dobrev’s California-cool kitchen. They’re soft, bright, and blend well with other still-trending kitchen essentials, like copper accents, white tiles, and even a cheeky chalkboard wall. The ceiling is often overlooked as a palette for color, and we’re not sure why — especially when subtle colors like this glamorous shade of ice blue play well with almost any design. Ice blue wall cabinets add a shot of color and provide much needed storage in a small dining space where there is zero room for ground level cabinets. 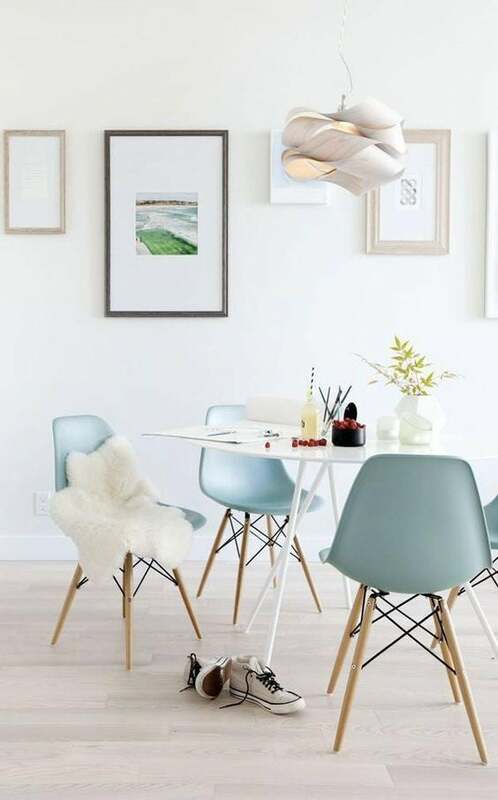 Soft blue dining chairs are the perfect addition to a simple Scandinavian-inspired dining space in need of color. This bathroom is proof that ice blue can add plenty of subtle color without overpowering even small spaces. The trim, vanity, and even that gorgeous old-world tub are feminine, classic, and oh-so-lovely. Forget yesterday’s nurseries with four boring (yawn!) blue walls. Instead, consider a Scandinavian twist by combining a paler shade of ice blue with pops of black and white for a more modern approach that’s still baby-chic. In a space that is already bursting with color and pattern, a white sofa may seem like the only option, but we’re loving this nearly-white pale blue color instead. A simple country-chic kitchen calls for a modern ice blue Smeg to inject a touch of retro-modern flair. Entryway doors bursting with eye-popping color are all the rage, but we think this simple pale blue version is just as bold and twice as lovely. This is the wood stove of our dreams, right down to that gorgeous ice blue color. Love, love, love!